The last thing Maldynado Montichelu—former aristocrat and current ladies' man—ever wanted was to be left in charge. After all, the team just blew up a train, crashed a dirigible, and kidnapped the emperor. It's kind of an important time. But, with Amaranthe captured by the nefarious Forge coalition, and Sicarius off to find her, the team is lacking in leaders. Also, Sicarius has made it clear that Maldynado’s life may be forfeit should anything happen to the emperor while he’s gone. To make matters worse, Forge’s cutthroats are after Sespian, and the young emperor believes Maldynado's loyalties are suspect. As if it’s his fault that his older brother is working with the coalition to usurp the throne. If Maldynado can’t figure out how to earn the emperor’s trust quickly, Sespian will go off to confront their powerful enemies on his own. Blood and Betrayal is the fifth novel in The Emperor’s Edge series. If you haven’t read the first one yet, you can pick it up for free. Emperor's Edge is a hidden jewel in Kobo. A series blending steampunk, fantasy and sci-fi, it depends as much on its vibrant characters as its rich world building. 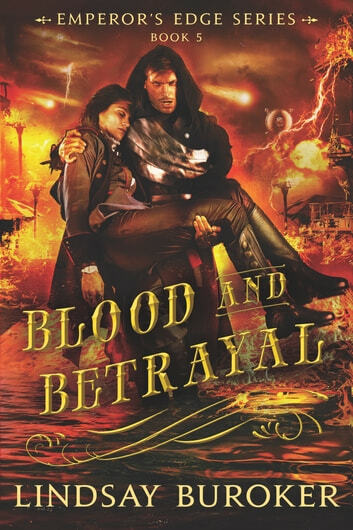 In Blood and Betrayal, the team of misunderstood heroes is bereft of their leader, Amaranthe, who's fallen into the sadistic clutches of Colonel Pike. Will she betray the precious secret of Sicarius, the assassin she's come to love - who was created by Pike as a weapon of the Empire? Will the Emperor Sespian learn the secret of his birth? And will Maldynado manage to keep the team together without Amaranthe's guidance, or survive the withering sarcasm of Sgt. Evrial Yara? The Emperor's Edge series is always full of spark and romance, even here, where the subject matter can get grim. Only a writer of great talent could create so many memorable characters, while spinning a complex plot full of breathless action sequences. Hopefully the end of Emperor's Edge will not be an end of Lindsey Buroker's writing. The action and adventure continues in this fifth installment in the Emporer's Edge series. Aside from the usual hijinks of the EE crew, we get to see things through the eyes of another member of the group which definitely makes things more interesting. If you have loved the previous books in the series, as I have, then you will love this as well. I absolutely love this series. It is keeping me from my work however. I keep sneaking off to the bathroom to read. When is it being made into a tv series? It would make for great viewing. Blood and Betrayal is awesome!!! Live all the books and can't wait to see what the gang gets into next. Thanks Lindsay for great entertaining books.